Current U.S. culture and politics is riddled with fake news and exaggerated fearmongering. 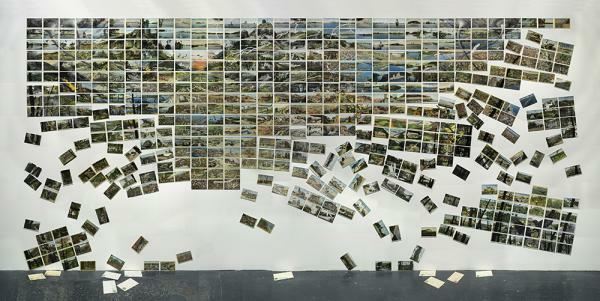 Paved with Good Intentions is a satirical installment critiquing this era with drawings on vintage postcards of American landmarks and destinations composed into a gridded landscape that mirrors today’s environmental chaos. In addition to the postcards, animated shorts and script-driven video in relation to the postcards are played. The exhibition opens on January 25 at the Institute for the Humanities with an opening reception and a panel discussion, “Good Intentions: Is Art an Effective Means of Activism?”, featuring artist David Opdyke, journalist Lauren Sandler, art historian Tara Ward, and arts curator Amanda Krugliak. This installation explores the power, or lack of power, that the arts have to address political and social issues. Open until February 26, you have a month to stop by the Institute for the Humanities to see this impactful mural. Angela is a sophomore studying English and the Environment. The only thing she loves more than writing and the arts are wombats.